And I just need to share this one with you! On May 23, the National Security Council (NSC) sent Judicial Watch a letter telling us that it would not provide us material we had requested related to former Obama National Security Advisor Susan Rice’s outrageous unmasking of Trump associates. 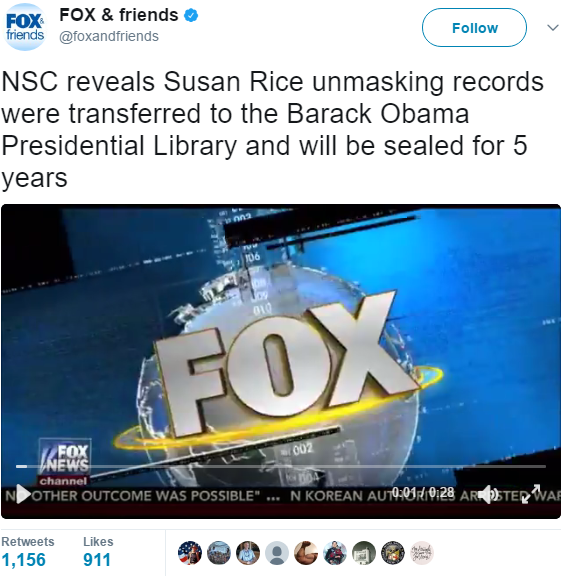 The documents, the NSC informed us, were moved to the Obama Library where -- under the Presidential Records Act – they would remain hidden from the public five full years! Rest assured, your Judicial Watch has no intention of letting this matter rest – because “No one is above the law”! PS: Tom Fitton will be on “Hannity” on the Fox News Channel in the 10 pm ET hour tonight, June 20, 2017, to discuss Judicial Watch’s letter, which demands the FBI recover records unlawfully removed by former FBI Director James Comey, as well as materials regarding the unmasking by Obama National Security Advisor Susan Rice of “U.S. citizens associated with the Trump presidential campaign or transition team” that were removed to the Obama Library. Also, Tom will be on “Fox and Friends” on the Fox News Channel in the 6 am ET hour tomorrow, Wednesday, June 21, 2017, to discuss this very important issue.